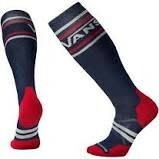 Get SmartWool performance with Vans personality with the PhD Slopestyle Medium Cushion Vans Socks. Embrace the terrain park in even the chilliest temperatures with the Smartwool PhD Slopestyle Medium VANS Stripes Socks. Their thicker merino wool construction works best with average boot fits and leverages the awesome heating and moisture wicking power of merino wool for all-day comfort laying the smackdown on rails and tables. Indestructawool™ Technology – Features a patent-pending construction method for exceptional durability and comfort. 4 Degree™ Elite Fit System – Uses two different elastics for greater stretch and superior recovery, as well as to keep the sock in place. Virtually Seamless™ Toe – As smooth as it gets. Cushion: Medium Cushion – Medium cushioned foot and leg for high impact absorption and ultimate warmth.